This short introduction to the United Nations analyzes the organization as it is today, and how it can be transformed to respond to its critics. 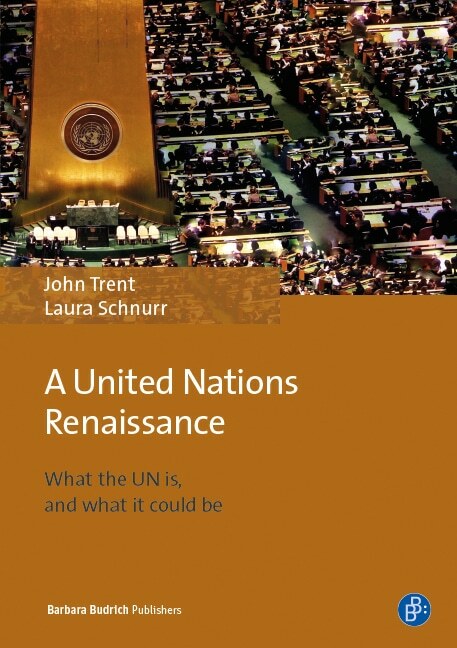 Combining essential information about its history and workings with practical proposals of how it can be strengthened, Trent and Schnurr examine what needs to be done, and also how we can actually move toward the required reforms. This book is written for a new generation of change-makers — a generation seeking better institutions that reflect the realities of the 21st century and that can act collectively in the interest of all. Workable Global Institutions: How to Get from Here to There? Prof. John Trent, Fellow of the Centre on Governance at the University of Ottawa, Canada, formerly professor and chair of the University’s Department of Political Science and Secretary General of the International Political Science Association for more than a decade. Laura Schnurr, MA, works on social innovation with the J.W. McConnell Foundation, completed an MA in Global Studies at the University of Freiburg, and runs a social enterprise operating in Canada and Uganda. Ein wichtiges, informatives Buch, das zur rechten Zeit kommt. Es macht deutlich, was auf dem Spiel steht: eine multilateral ausgehandelte, nach Aus- gleich und Frieden strebende Weltordnung, die in Chaos und Elend zu versinken droht.